Set in the heart of Fiji and surrounded by lush palms, vibrant bougainvilleas, and sparkling beaches, this is a resort you’ll never want to leave. Situated on gorgeous Malolo Lailai Island, the largest of the Mamanuca Islands, Lomani Island Resort is an adults-only paradise. 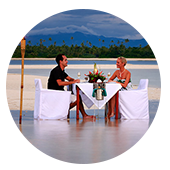 Whether you’re looking for an ideal honeymoon destination, a place to rekindle your romance, or a place to fall in love, we can design the perfect Fijian escape for you. After all, lomani is the Fijian word for love – so look no further for the perfect place to relax, reinvigorate, and reconnect. Once home to a copra plantation, Malolo Lailai Island now features an abundance of palms, frangipani, hibiscus and bougainvillea – and that’s just on the island! Explore Fiji’s breathtaking underwater scenery with our diving and snorkelling courses, or explore all that Fiji has to offer with our surfing, island-hopping, and parasailing tours. Adventure not your thing? Be truly pampered at the Lomani Spa, situated in an open-air beach bure, or sample some of Fiji’s great culinary delights at Flame Tree Restaurant. Create your perfect Fijian retreat at the adults-only Lomani Island Resort. Alternate lazy mornings on the beach with adventure-filled afternoons snorkelling, water-skiing, or hiking. A romantic getaway at a beautiful resort is the ultimate guilt-free, stress-free holiday, and you can find everything you need to relax, rejuvenate, and reconnect at Lomani Island Resort.